Last week we reviewed the Thermaltake MAX-1542 hotswap enclosure that puts four 2.5″ hot swap drive bays into a single 5.25″ drive slot. This week, we are looking at Thermaltake’s higher-density product, the Thermaltake MAX-1562 6x 2.5″ in 1x 5.25″ bay hot swap RAID enclosure for SSDs. This is clearly not a product we would have seen in the 15K rpm SAS era of 2.5″ drives (like my old 8x 15K rpm SAS setup) those simply required too much power, ran too hot, and were too large for a six in one configuration. Today’s article can be summed up in fairly simple terms, if you need the density, and your SSDs are the correct size, this is a great product. I do think the larger clearences of the Thermaltake MAX-1542 deserve consideration, but for pure density the MAX-1562 is a really interesting option. Overall, this provides a good mix of drive connectivity alongside a fairly fast test platform and a good looking chassis. 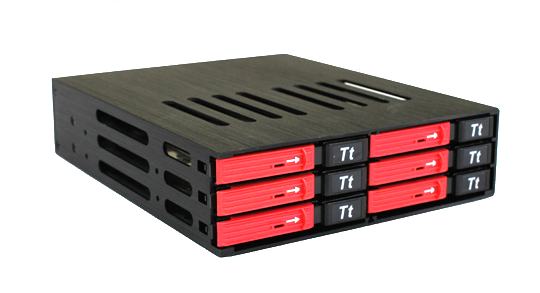 The front of the MAX-1562 is a very interesting configuration whereby six 2.5″ SSDs can be housed in a single 5.25″ drive bay. Note the fact that six drives are crammed into such a small footprint means that the tallest drives one can use are the 9.5mm tall. I want to point out that in a chassis, these things look really interesting with eye catching red, but as I mentioned in the Thermaltake MAX-1542 hotswap enclosure review, I am the type of person that would rather have an understated black finish over the red. Then again, I am probably in the minority here. Both enclosures really do pop out of a chassis though so I cannot say one is clearly better than the other from that perspective. The unit’s drive latches require one to slide the entire red portion in order to get them to de-latch from the main enclosure. Unlike the MAX-1542 there is no key locking mechanism. With the amount of movement required to free a drive latch, and the lack of a key locking mechanism, it is possible to inadvertently open a second drive if one is not careful. By exercising a minimum amount of due care, this should not be an issue for most people. I wanted to take a second and look at the drive trays. 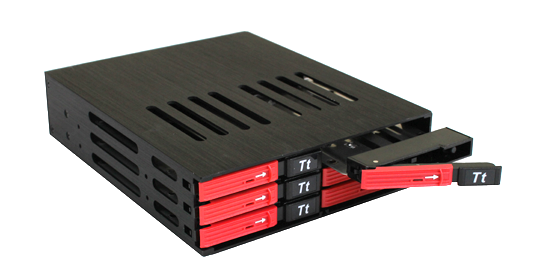 Unlike the Thermaltake MAX-1542, the MAX-1562 drive trays are very minimalistic in nature to augment density. Whereas the MAX-1542 had an abundance of material in its trays, the MAX-1562 has only a bit of thin metal. Once one screws a drive in, they feel plenty sturdy. I will say this is not the most smooth feeling I have felt from a hot swap backplane while inserting and pulling drives, but it is good enough for consumer PCs, low-end servers and workstations. The rear of the chassis is very interesting. One can see the dual fans, six SATA ports and one 4-pin Molex power connector. The power connector is different than that of the four bay sibling that utilized a SATA power connector. Then again, one power connector for six drives really cleans up wiring. I also wanted to take a second and note that the fan noise was relatively low, much lower than those backplanes meant for 10K and 15K rpm SAS drives. One piece of advice here is to use either the supplied SATA cables or a SFF-8087 breakout cable from a RAID card. Using right angle SATA connectors can be very problematic due to port density. Both using breakout cables and supplied SATA cables in the Corsair Carbide Series 500R‘s bottom 5.25″ bay provided a simple installation. Just stay away from right angle connectors for this enclosure. Overall, for those looking at a consumer 6-in-1 for solid state drives, the Thermaltake MAX-1562 is one of the only options around, and is a great option at that. It is relatively quiet which cannot be said for server versions. The big differentiator here is that this can fit six solid state drives in a single 5.25″ drive bay. I will say that this would have been slightly better if Thermaltake were to use all metal drive tray mechanisms and a color other than red. 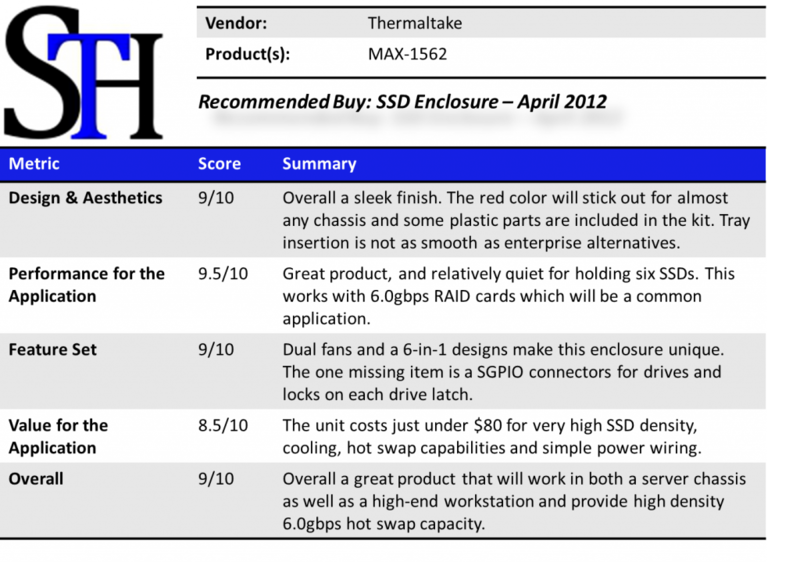 The Thermaltake MAX-1542 did a great job and earned a 8.5/10. In the end, for those users that need this kind of density, and that do not mind spending the money, this is a great option and worthy of a 9/10. Two of these can be used with an inexpensive controller such as the IBM M1015 to get twelve 2.5″ SSDs in two 5.25″ drive bays. Enough for an eight drive RAID array and a four drive RAID 10 array. By the way, what’s the little switch on the back of the unit for? Hard drive LED indicator switch. Like these a lot. Will you review other TT products? 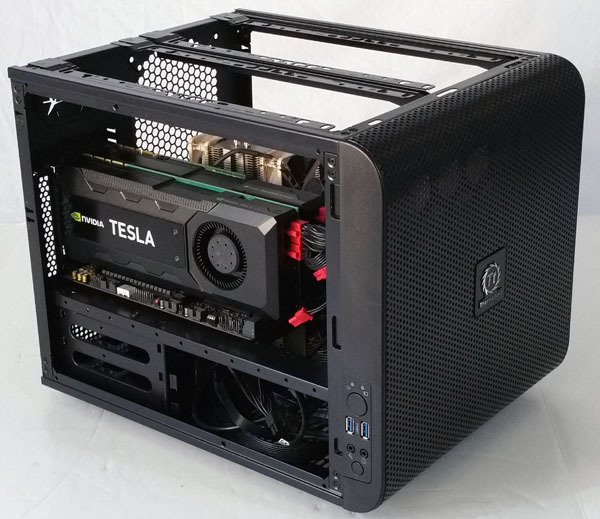 Maybe small form factor cases for mini servers or big cases for large server boards???!? Your conclusion statement is poor. First off how will you connect 12 drives to a 8 port M1015?? Also you state that you can get 12 drives in one bay. Each MAX-1562 is 1 bay that means 12 drives = 2 bays.. I have around 8 of these in service and they are 10/10. I bought a spare unit in case some extra sleds were needed but no problems so far. Hi Frank. Generally, we see installations in systems with 4-6 motherboard SATA ports. 4 + 8 = 12 drives. Glad you like the units that you have. Seems like the AMS DS-526SSBK is the same 6 bay unit. They do have different color on the drive caddy latch. Here is a good technical question. 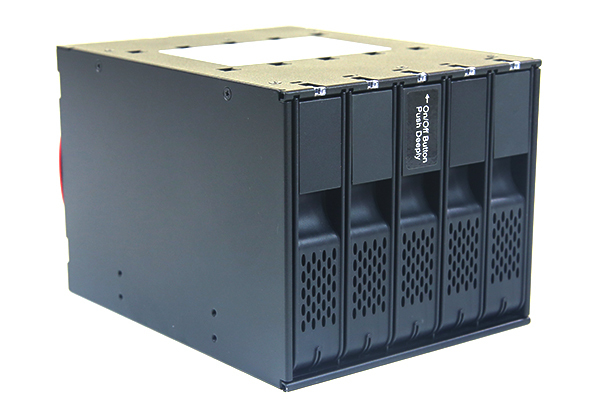 How much better is the Supermicro M28SAB-8bay 2.5″ drive cage as compared to the T/t MAX-1562. I like the density of the Thermaltake MAX-1562 but some of the negatives on egghead are backplane related. I don’t have alot of faith in those reviews but i do read them before spending. And of course Supermicro makes superb gear but it is pricey. I really could just used fixed bays if i could find a cheap 8 drive rack. I’m about ready to just make one. What would be a good gap for air around a 9.5mm ssd? Thank you for the informative review. I just used one of these in a compact server where it proved to be the perfect compliment to an ASRock E3C226D2I mini-ITX motherboard with 6 SATA3 ports. 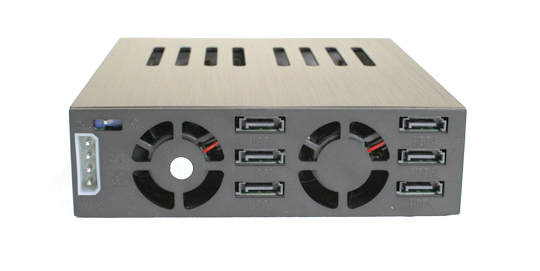 The backplane design and single power point was a big plus in the small 8″ x 6″ x 9″ case I used. This is a fine, fine product. The construction quality is very high. The trays are very sturdy and operate smoothly. The plastic latches are totally functional. Short of dropping a tray on it’s nose on a concrete floor I can’t imagine the plastic latch being an issue. And, hey, if you are dropping your hard drives on concrete you have bigger issues than plastic! look to be the same product in black/grey and different packaging. While the fans are reasonably quiet I took them out because I wanted more quiet. Easily done by taking 4 screws out, and easily reversible.